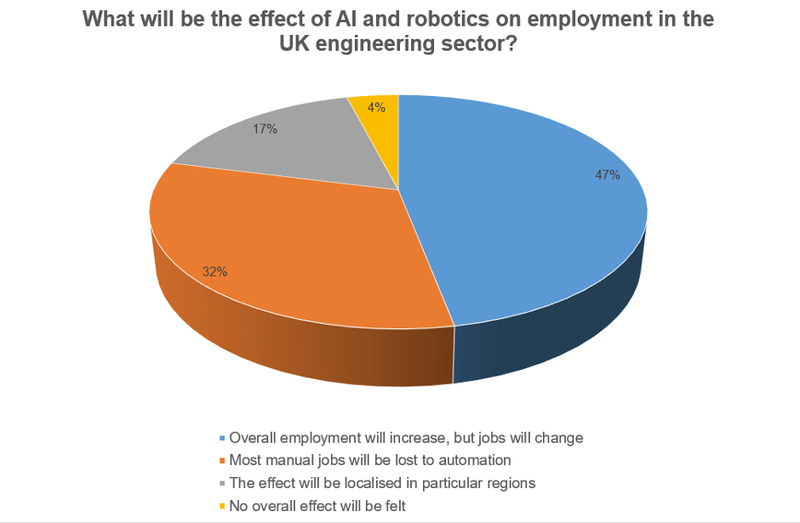 Last week we asked what effect AI and robotics would have on employment in Britain’s engineering sector, and it appears that respondents aren’t too worried about robots taking their jobs. Just under half (47 per cent) of poll respondents thought that overall employment will increase but that jobs will change. This was followed by the 32 per cent who thought most manual jobs will be lost to automation, and 17 per cent who thought changes would be focussed in particular regions. The remaining four per cent thought there would be no overall change. The poll was based on an OECD report that forecast 10 per cent of US jobs and 12 per cent of UK positions as being under threat from AI and robotics. What do you think? Let us know via Comments below. The first option should have been MANY manual jobs will be automated, because there are many others – particularly in construction, other outside work and jobs requiring much relocation movement, such as residential window-cleaning and interior decoration – for which automation will be very difficult, so unlikely to happen in the near future, if at all. The main problem with the poll is the time scales for the prediction if 2030 probably no. , if its longer then totally different answer. It only makes sense to automate jobs where there is a clear cost and efficiency saving and obviously this will be primarily repetitive type tasks with a narrow range of requirement variables, e.g. manufacturing. More complex and variable tasks in different environments will require very sophisticated automation which will probably be cost prohibitive compared to employing someone, especially as this will incur bigger maintenance and monitoring overheads. As with the earlier poster, I don’t believe that robots will be able to replace some manual labour, not for many years anyway. Other jobs will be lost to robots, the industry I work in is considering using robots for “cost reduction” as the prices of them fall. I don’t currently see how the increase in robots will maintain employment, the reliability expected of them will not drive a significant increase in maintenance staff, the simplicity of programming them (your own recent article on CoBots) means that there isn’t going to be a demand or ‘robot programmers’, so I expect jobs to fall over all. The areas I expect to see hit are the lower end of the wage market, such as supermarkets. These are already moving from manned checkout to self scan checkout, with the barcoding technology they already have in place it wouldn’t take much to create a simple package for a shelf stacker robot, once the safety levels necessary for the protection of customers is proven. I think that AI is often over-hyped, however, many low skill jobs will be lost as they require little in the way of complex multi-context information processing – I believe it will be a long time before we see a truly generally intelligent AI. Some one will work out that saving the low skilled/paid jobs is limited. When they work out you can save more money by replacing accountants, judges and lawyers things will change. in 1965, I recall it was rumoured amongst the Engineers in ICI (Fibres division of that massive organisation was probably the largest employer of ordinary staff and operatives-manually doffing and donning packages) that whereas a human “horse-power” cost 7/- (that’s seven shillings in old money) that of a “machine” cost 7d (denari, pence). ie 1/12 of the former amount. The opportunity and need for automation was substantial! Of course the retailers solved the problem by buying solely from Asia! removing the need for any UK manufacturing operatives: efficient or otherwise. ‘None of the above ‘was not available. Many jobs will change, as they have throughout history. We have mechanical street sweepers( in places!) but the broom-user is still needed. Likewise looms are mostly automatic. Also we don’t have 6-year-old boys climbing up chimneys or massive shipyards or errand boys- we have white van drivers instead of those. We may have huge mega-marts, but Arkwright still works his corner shop. How many software developers did we have in 1960? So don’t be despondent, life goes on. The first option is wrong and too simplistic. Manual jobs (invariably un or low skilled) are unlikely to change, however semi-skilled jobs ie those task that are repetitive and relatively fixed are prime targets for automation as we have seen since the industrial revolution started. High skilled tasks such as maintenance, design, repair, could increase, as machines cannot fix themselves (though I am sure this is an intention in its own right). The ability of the newly out of work to retrain and generate new jobs is questionable. The overall result then is de-skilling of the workforce in general, further increasing inequality and unfairness in society. I have been working in AI at a research level for the last year or so. There are a couple of things to say about AI before trying to predict the future. 1) AI has been studied for around 70 years, making it one of the oldest sub-fields of computer science. Alan Turing, amongst his many great achievements, laid the foundation of thought in this field shortly after the war. 2) AI is not a panacea. Many of the most important problems in engineering and science have no use for AI, and other techniques are well-developed and much more appropriate. AI will be transformational, but I think we’re in something of a hype-bubble, thanks to both industry and academia over-selling their work. Some blue and white collar jobs will be under threat, no doubt about it. Driving – one of the largest industries in the world – is the one to watch out for. Coping with this will be more a political problem than anything else. In the engineering profession specifically, I think AI will be a powerful addition to the tool-box of the engineer, sitting alongside maths, physics and IT. Both the artefacts we build and the techniques at our disposal to build them will be enhanced by this technology. I am quite confident about “Overall employment will increase, but jobs will change”. New technology always causes disruptions to the work force, just look at history and the effect of new technology. The technology in this case will effect most jobs, but it has many advantages in safety and doing dangerous jobs, that is a good outcome. The real question is whether the benefits are shared ? It could be the workers and employees will work a four day working week, that would be a plus, but if the benefit is restricted to a few, then it will mean higher unemployment and that would be a bad outcome. Just as a note, there is no evidence that “Ned Ludd” actually existed. We all look at AI and robots and have (probably) introduced them but there are a few things which tend to be overlooked. To introduce AI and robots is very costly – it would have to have a pay-back. The pay-back is (usually) from the savings on labour costs. So, there has to be losses of jobs in some way or another. – If the tasks change, even slightly, it is easier and quicker to “retrain” the human than the robot. – The robots will breakdown a lot more than the humans and will be more difficult to replace. – The robots will also tend to “age” quicker than the humans, becoming less reliable after a few years. – The robots tend to lose “support” from their makers after 10 years of so (try getting change parts ! ), the humans and their maker tend not to do this. I hesitate to point it out but the last time there was completely full employment in Europe was on May 8th 1945. Loss of traditional industries such as mining has shown the devastating impact such things can have on a town or even a region, and ‘service industries’ do nothing to ameliorate the situation. But just think how this has affected the continued/enhanced power of those who do not encourage manufacture, merely manipulation! Someone (human) has to design, build, test, service and eventually retire and recycle these robots. So, maybe not such bad news for engineers ? Not for Engineers and those with a technical skill…but I do fear for the many at the bottom of society who are only really fit to perform menial repetitive tasks. Education, education, education…is the key? Perhaps we are going to change the phrase from Idle Rich to idle poor! Clearly there is going to be an unemployment problem, according to many of the respondants. Also clearly the present market based economic system has no answer to large scale unemployment. It never has in the past and there is no reason to suppose that it will have an answer in the future. Clearly a redesigned or even new type of economic system is needed to deal with this, perhaps separating income from the value and cost of work and as mike blamey says, education, education education, will definitely be needed. The alternative could be social upheaval, and violence. We desperately need more technically and socially aware MPs who are capable of independent thought and action. One can only hope! !